Blood Never Lies is a duet of companion novels to the Eye of the Storm series. The two novels are called Blood Shadow and Aftershock. They also act as PREQUELS to two brand new series to come. You don't have to read Eye of the Storm to enjoy these new books (some background is given). However, we always recommend you do in order to gain full understanding of how the characters have arrived at this point. 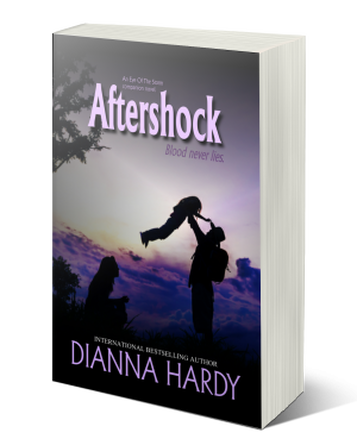 READER'S TIP: If you've read The Witching Pen series, Aftershock holds a surprise for you! SPOILER ALERT! Do not read this blurb if you have yet to finish Reign Of The Wolf. After the unexpected death of her childhood best friend, Sarah, Claire has nurtured both an open wound, and Sarah's baby - a miracle born on her deathbed. However, despite their love for their adopted daughter and each other, fate's about to test the foundation they've built. Jasmine has been having episodes - seizures - the doctors aren't sure exactly what they are, or what triggers their onset, but when a little boy is hurt by Jasmine's hand they can no longer wait for answers. They consider taking to the road once more believing a life of travel might be safer than planting roots.